The worldwide growth of the FCBEscola project has meant that the sixth edition of the International Tournament has been moved to the Ciutat Esportiva Joan Gamper in order to cope with the huge volume of players, which in 2017 have amounted to 1,500, which naturally means more teams and much more matches. That’s why the tournament has returned to the place that was partially used as the venue for the first edition in 2012. Since Monday 10, the Ciutat Esportiva has witnessed scenes like never before – nothing like the calm, relaxed mood usually, where the quiet is only broken by the different teams training. The FCBEscola International Tournament means that there are around 5,000 people coming to the fields every day to take part in some way or other in the event – not just as players but also as coaches, staff, friends and relatives and other support personnel. As well as the games, there are plenty of other things to keep everyone occupied. 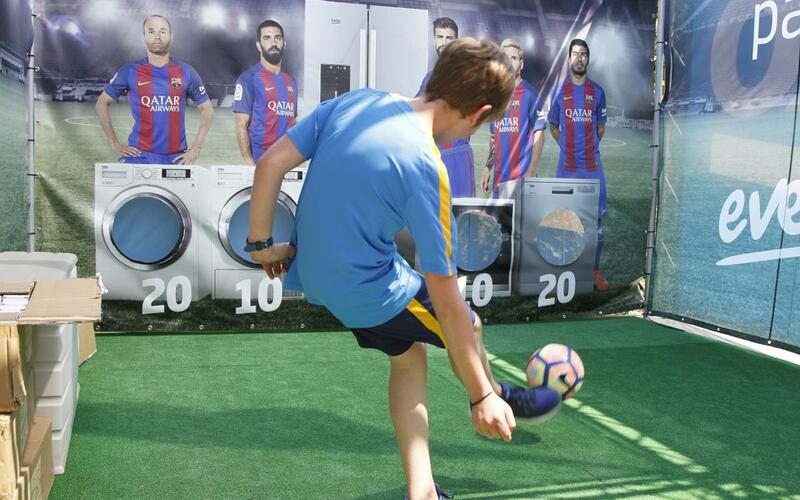 These include the chance for a picture with an image of the FC Barcelona first team, Konami Pro Evolution Soccer 2017 matches, a mechanical donkey, games of foot-tennis and ping pong, a Beko organised target practice event and even a ball skills circuit. Not forgetting the food trucks that have been providing all kinds of scrumptious goodies to keep the youngsters fed in between games.